Since March, over a hundred gay men in Russia’s Chechnya region have been targeted, detained, and secretly tortured because of their sexuality. Located in southern Russia and in a historically homophobic region, Chechnya is a place where gay men have been forced to hide their identity, often through getting married to women and starting a family. But in a way, they still had some degrees of freedom: through some online chatrooms, they could connect with others in the community who are also gay and interact with them anonymously. However, this channel has been turned into a trap to capture gay men in Chechnya in a new anti-gay program initiated by the region’s new pro-Kremlin leader Ramsan A. Kadyrov. Homosexuality has long been a taboo in Chechnya, because the majority of residents believe in Islam and consider the existence of gay men to be in violation of their beliefs. Religion has long been used as the justification for abuse of human rights of minority groups: in Western countries, Christians often justify the persecution of the LGBTQ population by using certain interpretations of passages from the Bible. Although much has changed in Europe and America in recent years and acceptance of the LGBTQ community is becoming more widespread, tolerating the use of religion as a means to justify such brutality in a region far from where we reside only diminishes the effort human rights groups have made in the past to ensure that LGBTQ rights are viewed no differently from the basic human rights that heterosexual people are afforded. 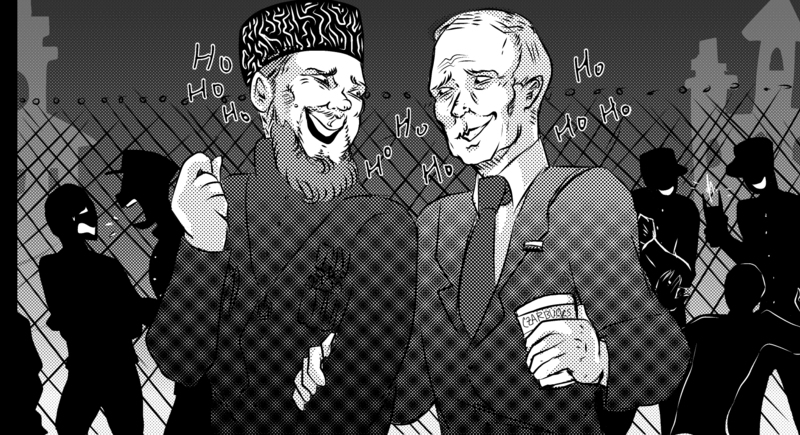 Although various activist groups and many human rights volunteers have expended effort to evacuate Chechen gay men from the region, the amount of protection they could guarantee the LGBTQ population is limited without intervention from other countries. The United States government has not only failed to stand up and condemn such violation of basic human rights, but also chose to not address such a problem. Nikki Haley, United Nations ambassador who represented the United States, was the highest U.S. government official to comment on this event. She described the detainment and abuse of Chechen gay men as “[the opening of the] first concentration camp for homosexuals since Hitler’s in the 1930s where campaigners say gay men are being tortured with electric shocks and beaten to death.” However, other high-ranking government officials have neglected to so much as comment on the situation, making it clear that they cannot be counted on to take a stand against the violence and hatred. The United States’ choice to not intervene is eerily similar to the official response from the Russian government regarding this matter. When asked about the policy that led to this prosecution, Mr. Kadyrov responded, “I can officially say there is no policy because there is no problem. If there were a problem, there would be a policy.” But there is a problem, and the persecution that gay men are facing in Chechnya is only one manifestation of it: LGBTQ individuals are still seen as less-deserving of basic human rights in many places and situations. We are privileged to live in the United States at this time, where much of the road to equality has already been paved for us. But this does not mean our job is done: Instead of being a fundamental human right, LGBTQ rights are still not universal, because they have not been widely recognized or addressed in many countries around the world, especially in majority-Muslim countries and those that were previously communist — or even in parts of our own country. The fact that the United States has neglected and refused to comment on this problem reflects the domestic problem with LGBTQ rights. Since President Donald Trump was elected, the protection of the LGBTQ population in the workplace has been weakened. Though claiming to support the LGBTQ community, Trump excluded transgender individuals from a much-needed protection thanks to his position on the transgender bathroom case. In addition, Trump has cut funding from AIDS and HIV research and treatment, among other protections for the LGBTQ community. Hillary Clinton, former presidential candidate, spoke about the lack of response from the United States government on this matter, and the consequences of letting such brutality slide. “We may not ever be able to count on this administration to lead on LGBT issues,” said Clinton. But she continues to maintain that “gay rights are human rights,” and believes that the government has a duty to take a stand. The danger of neglecting this issue does not only affect gay men thousands of miles away, but also to the currently established human rights within Western countries. By allowing Russian government officials to treat gay men like subhumans and deny their existence, we let them downgrade the importance of such a basic human right that should be universally applied to simply a policy in the United States or particular countries. This toleration also allows for people of dominant religions to persecute and discriminate against groups of other humans. The silence of the United States in this matter is no different than permission for such brutality to go forward.